Department of International Relations of Universitas Muhammadiyah Yogyakarta (UMY) collaborating with Ministry of Foreign Affairs of the Republic of Indonesia conducted a review of a book entitled ‘Jejak Orang Jawa di New Caledonia’ by Widya Rynanta (Former Consul General of the Republic of Indoneisia in Noumea) on Tuesday (4/9) in Amphi Theater of Graduate School of UMY. There was also a discussion on Indonesian Government’s Policy in the Asia Pacific Region at the book review attended by students of Department of International Relations of UMY and several official of local government of Bantul. Meanwhile, a discussion session was led by Secretary of Directorate General of Asia Pacific and Africa Rossy Verona and Former Secretariat Director of Indian Ocean Rim Association (IORA) Firdaus Dahlan. Rossy invited Department of International Relations of UMY to cooperate in providing students knowledge of public policy so that they do not only learn theories but also recognize facts through experiences of diplomats of Ministry of Foreign Affairs. Rossy described Indonesian government’s policy in Asia Pacific. With 10.5 million people, small Asia Pacific countries possess great potential in areas of diplomacy, industrial developments, and others. The policy referred to instructions of the President of the Republic of Indonesia. “President Joko Widodo declared that Indonesia should commence cooperating with Asia Pacific regions,” told Rossy. Besides, the book review was led by the author Widya Rinanta. The book comprises of 34 stories divided into four parts about the existence of Javanese culture in New Caledonia. 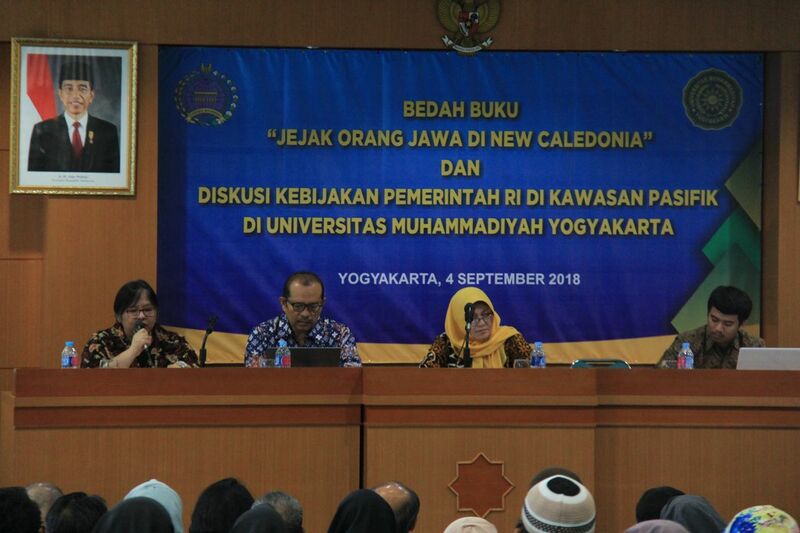 However, the people living in Caledonia are not Indonesian citizens, but they are under a territory of French government and have yet achieved their independence. The book shows that Javanese people living overseas are in not only Suriname but also New Caledonia. Even though they are no longer Indonesian, Javanese people in New Caledonia remain preserving Javanese culture such as slametan, nyadran, arisan, and ingkung. Additionally, the editor-in-chief of the International Relations Journal of UMY Ade Ma’ruf Wirasenjaya believed that the book is marvelous to expand students’ knowledge of diplomatic contexts. “From a perspective of international relations, the book offers essential post-realist views,” he conveyed.